The gold winners and the officials of Bangladesh Special Olympic team pose for photograph at Abu Dhabi in United Arab Emirates on Wednesday. 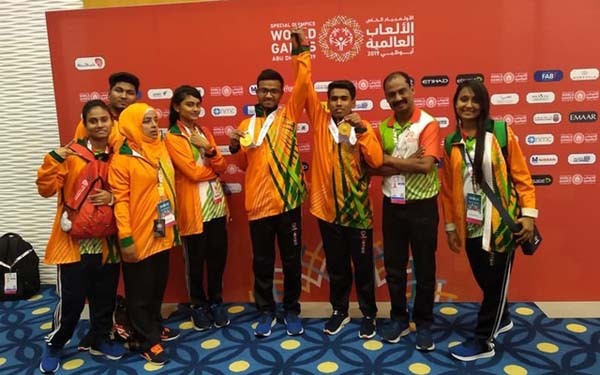 Bangladesh Special Olympics team have clinched 22 gold medals in the ongoing Special Olympics World Games 2019 in Abu Dhabi and Dubai cities in United Arab Emirates. They also bagged 10 silver and six bronze medals until 8 pm Wednesday. Bangladesh Special Olympics Women's Handball team emerged champions beating the Netherlands 5-1 in the final in Dubai on Wednesday. However, Men's Handball team finished runners-up losing to neighboring India in the final on the same day. Earlier, Bangladesh reached the finals of the Men's and Women's groups, participated by some 71 counties of the world. A 139-member contingent is representing Bangladesh in 11 disciplines - athletics, swimming, bouchi, table tennis, badminton, handball (women's), handball (men's unified), football (men's and women's unified), volleyball and basketball (unified). About 7,000 athletes from 190 countries are taking part in the eight-day meet. Bangladesh team will return home on Friday night after attending the closing ceremony Thursday (March 21).